DULUTH, Minn. - The No. 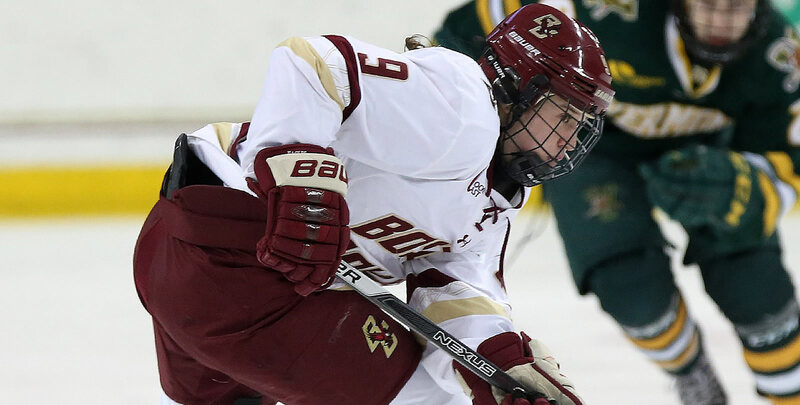 4 Boston College women's hockey team fell in the 2018-19 season opener on Friday night, dropping a 4-2 contest at No. 9 Minnesota Duluth. The Bulldogs used two third period goals to earn the win at Amsoil Arena. After the Bulldogs opened the scoring, the Eagles settled down and Maddy McArthur stepped up in her first career start. The freshman was peppered with 14 shots in the first frame, making 13 saves. Daryl Watts' unassisted, short-handed tally evened the score at the first break. Erin Connolly and Megan Keller's combination just two minutes into the middle frame staked the Eagles to a 2-1 lead. As the second period was nearing its end, McArthur's right pad save at the right post of a cutting Gabbie Hughes kept the game tied - only to see the Bulldogs tie it up with 3:29 to play. The game's third lead change came early in the third period, when Sydney Brodt gave the Bulldogs a 3-2 lead. The hosts then took advantage of some penalty trouble for the Eagles, scoring on a 5-on-3 situation near the midway point of the frame. A power-play for the Eagles a bit later couldn't result in a goal despite shot attempts on the chance for BC. Delaney Belinskas hit the pipe with 40 seconds to play but that would be the final look of the game for BC. McArthur (0-1-0) finished with 31 saves for the Eagles while Maddie Rooney (1-0-0) finished with 25 for the Bulldogs. UMD's final edge in shots on goal was 35-27. Boston College went 0-for-2 on the power-play while Minnesota Duluth was 1-for-3. 1st, 6:46 | 0-1, UMD GOAL: During a 4-on-4 situation on the ice, Ryleigh Houston and Gabbie Hughes entered the zone in a 2-on-1 situation with Keller. The two Bulldogs passed it back and forth between for Skinner slid the puck to Houston at the left circle for a one-time finish past McArthur. 1st, 15:22 | 1-1, BC GOAL: With the Eagles short-handed, Watts pressured the Bulldogs in the neutral zone and forced a turnover. Coming down the left wing, the sophomore cut over to the right and she was able to slide the puck back through Rooney's pads. 2nd, 2:09| 2-1, BC GOAL: After Keller took the puck from Willow Corson down the left wing, she was able to get even with the defender and reach around for a centering pass. Connolly was crashing at the right post and banged it home for the lead. 2nd, 16:31 | 2-2, UMD GOAL: Anneke Linser shoveled the puck through traffic and while it was initially blocked by a BC stick, the puck bounced to Ryleigh Houston at the left post for a tap-in. 3rd, 3:35 | 2-3, UMD GOAL: Naomi Rogge got the puck to Sydney Brodt going down the left side of the slot and as she neared the left post, Brodt backhanded it above McArthur's blocker. 3rd, | 2-4, UMD GOAL: In a 5-on-3 situation, Lizi Norton took a wrist shot from just above the face-off dot, and the puck deflected off a BC shoulder on its way to the net. - Boston College is now 13-11-1 all-time in season openers and 7-4-1 under head coach Katie Crowley. - With the win, UMD takes a 7-6-1 edge in the all-time series. - Five players made their debut in a BC uniform, with freshmen Olivia Finocchiaro, Savannah Norcross, Jillian Fey and Maddy McArthur making their collegiate debuts and junior Lindsay Agnew appearing in her first game for the Eagles. - McArthur's 31 saves marked the most by a rookie BC goaltender in her debut since Molly Schaus made 18 in her first collegiate game against Rensselaer on Sept. 29, 2006. - Daryl Watts has now registered at least one point in her three careers games against UMD. Boston College and Minnesota Duluth will meet for the second tilt of the two-game series tomorrow, Saturday, Sept. 29, at 4 p.m. EST at Amsoil Arena.